No other place on Earth is as rich and varied in marine life as the "Coral Triangle", which is part of the Asia and the Pacific region. It covers Malaysia, Indonesia, the Philippines, Papua New Guinea, Solomon Islands, Fiji and Australia. New Zealand now has its own section: for the up-to-date reports go to New Zealand Diving. Indonesia now has its own section: click here for Indonesia Diving. East Timor now has its own section: click here for East Timor Diving. East Timor is South-East Asia's newest nation and a new destination for diving. Whilst the border region with West Timor may be troublesome, Dili and areas further East are generally safe. "Totally unspoilt diving - couldn't wish for more - sharks, turtles, millions of fish, giant squid, rays, abundance of living coral. Only need to swim out from shore about 5 metres before you hit the drop off round the island - and this slopes gently to about 40 m, and then straight down to about 2 km! Also great diving around 10 m mark - so air lasts for ages. More fish species here than anywhere else in the world. Living coral like I have never seen. Divers paradise. " "Shore Dive. Slope to drop off.. garden eals, Frog fish, leaf scorpian fish and more.... one of the closer dive sites to Dili. " "Closest of all dive site. I was told this was the training dive site. Although not as fantastic as the rest of Timor with a good guide this is a great close dive. " "Fantastic dive when the tide is in as there is a 40 m surface swim. With the tide out its a little harder in the shallows. But well worth the effort. Another great Site in Timor...Has to be visited. " "A lovely gentle dive. You should only dive this site at high tide as you may damage coral at low tide. " "30 m Cave on 100 m wall...Everything everywhere...got to see it to believe it. " "Great fast deep dive. Thousands of pelagics and sharks. One wild ride. " "Deep Dive on Atauro island. Great dive with strong current. The highlight is the large schools of pelagics and sharks. Great thrill rush dive. Good guides and safety needed. " "Cove dive in smooth waters. Huge 80 m wall with great overhangs and amazing reef and marine life. " "Calm wall dive with great reef and wild over hangs. Best time to dive around 2 pm as the shadows make for a great effect for photos. No mantas on my dive but everything else. " "Bite in the corner of a cliff. Great wall dive with many over hangs and no current. Deep or shallow this wall dive has it all. Must dive from boat. " "Great wall dive with huge amount of fish and Jurassic size corals. Can have a wicked current too. " "Wall dive that ends on a sand flat bottom with sharks gallore. Great dive with the best vis i have seen (40 m easy). " "Great clear water dive at the tip of Atauro Island. Great wall dive that opens up to flat sand bottom with small coral outcrops. Great for sharks. " "We wanted to dive at Atauro, and Kim from Compass Charters was very helpful...On the journey to Atauro we saw dolphins and whales � our skipper carefully steered the boat so we could watch them as long as possible. The diving at Atauro is excellent - the coral is in beautiful, undamaged, pristine condition and visibility was approximately 25 meters." " A whole island of walls, currents, pelagics and critters. Untouched for thousands of years "
"Small island at the east end of the country. The best diving I have ever seen. Clear calm water with so many fish and untouched reefs. " "20 dive site within 40 km of the capital. From wall to muck to amazing reefs. Easy access via car. " "Easy dive, swimming along sloped dive wall, huge turtle, great scorpion fish, "anenome city", good sandy patch to hover and watch the world swim by." "We wanted to dive at Atauro, and Kim from Compass Charters was very helpful. We contacted them in Dili one day, and they were able to organise to take us by boat to Atauro the next day (they need 3 divers as a minimum number). The diving is run by an Australian couple, with a Timores First Mate, and they were great to dive with. The boat that we went out to Atauro on is a powerful, safe, (ex-US embassy) boat. On the journey to Atauro we saw dolphins and whales � our skipper carefully steered the boat so we could watch them as long as possible. The diving at Atauro is excellent - the coral is in beautiful, undamaged, pristine condition, and visibility was approximately 25 meters. The diving instructors are extremely competent - they gave a safety briefing before we departed Dili - and they are relaxed and friendly, and provided a tasty lunch. A great day." "Just had a fabulous experience diving off Atauro Island and east of Dili in East Timor with Compass Charters. Professional, good equipment, careful dive briefings and good company. The diving itself was amazing with almost perfect viz. So much coral and so many fish all in a small area, water was a perfect temperature and absolutely no one else around!! Highly recommended." Five years experience in the country. Full time PADI instructors, 3 dive vessels and two dive centres. "Dive Timor Lorosae has to be Timor's premier dive centre. With purpose built dive vessels (with seats) full time staff (rare in Timor) and professional and friendly staff, it's easy to see why Dive Timor Lorosae has established themselves as the leaders in this undiscovered country. Their boat is a purposed built dive vessel that is made especially for Timor. The hour trips in Timor mean you need a seat on the trip. Worth the price at around 125 USD you get your money's worth. Best diving I have seen to date. Will be coming back in the new year. " "Dive Timor Lorosae is without doubt the premier dive centre in East Timor. Located right on the beach (and having two dive centres) these guys are the friendly, professionals you expect to find in the diving game. I would dive with these guys every time. The boat is great. Heaps of room and with seats. All boat dives take about 1 hour to get to so comfort is needed. Be careful the other dive operators (if they have boats) don't have seats! I stayed next to the dive centre is these massive rooms that cost about 30 USD a night. Great value and location. Boat dives are around 125 USD with everything included. Gear, lunch, drinks and guides. The day is from 9am till 5pm with whale watching dolphin watching and heaps of other water activities. Well worth the cash - but ask for a discount! The diving would have to be the best I have seen. So untouched and remote. These guys have been doing it for 5 years so they really know how to look after you. " "Dive Timor Lorosae is by far the most experienced and professional company within in this new dive destination. With the only fleet of dive vessels that are comfortable and safe DTL is the way to go if diving in East Timor. A twin dive was 100 USD including everything, gear, tanks, lunch, drinks and whale/dolphin watching. Good price for what you get. Probably one of the best dive areas i have been to. Lots to see and so close. More fish than divers. The night life is a little slower but great food. " "Explore Timor are a new operation in Dili East Timor. All the equipment is brand new from the ground up...A refreshing change, need I say more...I would dive with them again. Very well run and great attitude from all the staff. Very good value for money. different packages for different people...the more we dived the cheaper it got. And it was cheap with the FREE rooms. They are basic with A/C but it is all i needed. The staff there would do anything. Carry tanks wash your gear...you name it...Some places in my experience in Timor will not even help you off load your car after a days diving. " "FreeFlow Diving were excellent. The owner/divemaster knew the dive sites very well. He has done over 3000 dives in East Timor already! The cost was very competitive compared to the rest of Asia. I would definately dive with FreeFlow again. And I didn't have to carry my equipment from the car afterwards. FreeFlow arranged all my accommodation for me and my party. Very efficient. The food provided by FreeFlow was outstanding. My girlfriend is vegan and she said the meal was better than she could have prepared herself. " Includes 32 dive sites. 176 pages, 2011. "A fabulous wreck dive with mostly great visibility. The bottom being at 30 m you can on a good day see the wreck from the surface. Fabulous to 'fly' through the bridge etc. " " Poor viz from river run off in close dive sites. The one dive shop there was not good - saw the instructor (who owned the shop) stand on coral to demonstrate mask clearing. The owner also anchored straight onto pristine coral with no care. Few diving facilities and not really a place for a full on diving holiday. " "I have lived in New Guinea for 15 years. 3 of those years I have spent diving in the waters around New Guinea, in the that short time I have seen 5 major ship wreaks 7 WWII bombers fully intact and enough coral and wildlife to fill up the continent of Asia. There are wrecks from all over the world in new guinea, one ship I dived was 32 meters under, but the mast was only 5 meters below the surface. It was a cargo ship from WWII it was about 45 meters long. There are many places around New Guinea and the Solomon Islands that are excellent for seeing blob-headed clown fish, schools of 400 barracuda, sea turtles, sharks: the fish come in ever colour in the world. There is one dive that I did called the gates...two massive coral pillars that form the sides of a long wall underwater. When the tide goes out all the water is sucked through the gates which are forty metres high, when the tide comes back in all the sea life comes to feed on the plankton, and then the larger predators come to feed on the sea life it is an awesome sight. If I were to count the sea life individually, I would say, at the Gates, there was about fifty million fish. No joke. Despite what rumours you have heard about New Guinea, it is really a friendly and secure place if you go to the scuba places. There are a few that I will name for you, Coral Sea's Resort, Kevieng (New Ireland Province), Jasoben, Madang (Madang Provence), Hoskins (West new Britain). " "Rabaul has a reputation for wrecks, particulalry WW2 wrecks. Well, I just wanted to let people know that I have recently come back from a trip to Rabaul and found it a little disappointing. To put this into context, whilst I have not dived Truk, I have dived a fair few of the WW2 wrecks in the Solomon Islands and Coron, Philippines. Back to Rabaul: because the volcano is still smoking, it is dropping ash into the harbour which is close by, so many of the wrecks are quite silty and vis can be poor. In addition, because of seismic activity, it is inadvisable to penetrate many of the wrecks in the harbour. This is a great shame, because there are many good sized wrecks around. My vote for best wreck goes to the Manko Maru, followed by the Italy Maru, both of which are a short boat ride in the harbour. Outside the harbour, George's wreck was not bad either. Hope this helps divers thinking about their next wreck diving foray. "This is a great and relatively shallow drift dive - around 23m. When the current is running, this attracts lots of sharks, from white and black tipped reef sharks to the bulkier grey reef sharks. You have to be careful not to get swept down the passage, which would be a bit annoying, but there is a permanent mooring line to latch on to when ascending and doing safety stops. This really is a shark divers dream - I was totally "sharked out" after three dives here. " "A real adrenaline dive. You can get 2 dives in one, depending on how vicious the current is and so where yoou jump in: there is a ship wreck at the edge of a finger shaped piece of coral. You can descend to see the boat first and then head for this area of coral where there is usually a fast running current. Here you usually see lots and lots of BIG fish, ranging from Spanish Mackerel, tuna, trevally, to all the usual reef sharks. You do need to hunt out a piece of dead coral to hold on to as the current here can be pretty racy, but is at least one permenent mooring line to help with descents and ascents. " " Diving off the coast of New Britain, this reef has something for everyone who likes reef diving. A wall, large sponges, anenomes/anenome fish, unicorn fish, plenty of cleaning stations, sharks in the large variety, blind shrimp and gobies, soft coral and a plethra of reef usuals for PNG. " The SS President Coolidge, launched in February 1931, was a luxury ocean liner. She broke several speed records on her trips to Japan from San Francisco. During World War II she became troop carrier for the American Army. In 1942 she hit mines on the way into Espiritu Santo, Vanuatu. All but two of the men got safely off the ship before she sank. She now lies on her side between 17 and 70 m, bow to stern. The President Coolidge is fully protected by law and both it and the surrounding seabed has been designated a Marine Reserve. The wreck is huge and needs several dives to do it justice. "The best wreck dive - fantastic! The President Coolidge off Santo, northern Vanuatu, was a WW2 luxury liner. It was commandeered by the US navy and fitted out as a naval ship. Unfortunately, it bumped into one of its own mines and now we dive it. (There was no loss of life.) I dived with Alan Powers December 2001 - there are 3 dive operators, Alan Powers and Aquamarine plus 1 other Pro Dive?? Safety is hugely important as it is such a deep dive. First dive is a check out dive to see how you are to around 30 m. If you are comfortable, then it's 2 dives a day and deeper and deeper if that is what you want. The engine room and one of the dining rooms are about 47 m, the promenade deck is about 33 m, the mosaic lined swimming pool - weird -is about 50 m It's a fabulous dive, as, if you are suitably qualified, you can penetrate certain parts of the wreck - the best wreck! There are long deco stops, which if you dive with Alan Powers you can spend in their transplanted coral garden and try and blow better bubbles than Twami. Mind you, this is not a good dive site if you are heavy on air! " "The world's largest accesible wreck. Even as a shore dive! Starts at 8 metres dropping off to 70 metres. Total penetration. Swim through the holds to see American WWII jeeps still in their crates! " "Especially a night dive with the flashlight fish with no lights - one of the most other worldy experiences on the planet - beats drugs hands down!! What a beautiful beast the old girl is looming up out of the sand. " "Awsome, I cant give it justice by writting about it, Just do it :) "
"Enormous wreck, so much to see with a great coral garden providing entertainment during the deco stop "
"Full penetration, deep deco diving, historical artifacts, easy access shore dive. " Please go to the Fiji Diving page in our Pacific section. Tokoriki Diving, Tokoriki Island Resort, PO Box 10547, Nadi Airport, Fiji. New Caledonia is an island to the East of Australia, governed by France. Citizens of the European Union, Switzerland, Canada, Japan, New Zealand, Australia and the USA can enter without a visa. New Caledonia claims the world's second biggest coral reef. Getting there from Europe means either flying from France, or flying from the UK to Eastern Australia and getting an onward flight from there. North American flights go from San Francisco, Los Angeles and Vancouver. All international airlines land at Tontouta International Airport, 45 km north-west of Noumea. From mid-November to mid-April the weather is warm and humid, the coolest months are July and August. Average maximum temperatures vary from 22 oC to 28 oC (71 oF to 82 oF). The cyclone season runs from December to March. "A series of walls, tunnels, canyons for an incredible atmosphere and an underwater photographer paradise. Some walls covered with gorgonians and all the usual tropical indo pacific marine life. The best dive site in New Caledonia, on the second biggest barrier reef in the world and one of the world best kept secret diving destination. " "The minimum to be expected to see in South-Pacific can be observed during the first ten minutes: multicolored tropical fishes, huge triggerfishes, tunas, banks of carangs and phosphorescent corals. In the following fifteen minutes, local specialities have been observed in drifting dive: a big mother loach, some small black-tipped and white-tipped sharks (a metre fifty maximum), some grey sharks (two metres fifty maximum) and a big tortoise at a distance within ten metres. With that, one already can be satisfied and it is what Gérald was thinking whereas they were crossing a rather beautiful coral platter but with no more surrounding fauna: "And here we are, it is finished ... Not bad at all!". But suddenly, appearing from the deep blue end of the platter, two manta rays, the biggest one of about three / four metres in width, came quietly on them, swam over them and left. Fantastic! But they turned back and came closer and stay about 10 minutes with them, playing so close that half of the divers have been able to caress them (It is not good! But difficult to refrain from it!). Extraordinary! " Pronounced nyu-way, Niue has less than 2000 inhabitants. It is in the South Pacific, east of Tonga. "Recently visited Niue Island on recommendation from a friend that had previously visited and found the place a treasure. It has the most amazing water visibility and excellent cave dives with a diverse array of marine life. Have already booked for 2008 with a couple of other friends. Check out www.niueisland.com. Not a lot of people have heard of this little island but its worth the trip despite arriving at 3 am in the morning. Have to go thru New Zealand to get there and flights are only once a week. Apparently the island gets less than 2000 visitors a year. " Whales from Antarctica visit the relatively warm, crystal-clear waters of Tonga to give birth. Brightly coloured, with dark tops and white bellies, the Antarctic humpback whales arrive from July through to September. You can see these from a liveaboard. Diving The Maldives is now in its own section. Please go to the latest Maldives information. April is the calmest month in the Seychelles and thus has great visibility. This is when the wind switches from Northwest to Southeast. It is also low season. "Pristine coral reefs, mantas, octopus and tritons. Outstandingly clear water." Much of the Seychelles information was provided by Illusions Liveaboards. The offshore dive sites of the inner islands have a lot to offer. The topography is a continuation of the beautiful rock formations that have made many Seychelles beaches famous. These granite formations are covered with soft corals and are very dramatic in places. Due to strong currents that may occur, these sights are more suitable for experienced divers. The optimal time for divers is from September to May when the winds are light. Each site has many small reef fish in abundance: oriental sweetlips, butterflies, moorish idols, little glassies, schools of fusiliers. The pelagics include tuna, barracuda and the trevally families: giant trevally, bluefin, bigeye and yellow spotted. Large schools of bumphead parrotfish are found on many sites. Schools of eagle rays, bat rays and large individual stingrays are seen often. Many encounters with Whalesharks have been logged during the migrating season in November. Individuals have also been encountered in April and December. There are also many sightings of green turtles and hawksbill turtles, both of which breed and nest in Seychelles. Reef sharks are a common sight at most divesites: black tip, white tip, grey reef and nurse sharks. Moray eels, geometric eels, ribbon eels, octopuses and scorpionfish are common sights. A British Royal Navy Fleet motor tanker. She was loaded with 40,500 tons gasoil when she sank in 1970 after hitting an uncharted rock, badly holing her starboard side. She now lies in 3 sections at 30 m. The stern section is relatively intact, with the wheelhouse and propeller easily accessible. Diving with large numbers of grey reef sharks: the underwater topography of Marianne is exceptional. "Not as good for diving as the Maldives, but better destination if going with a non-diving partner. The diving is very easy and at certain times of the year you may see whale sharks. They allow a maximum of 2000 tourists and there are huge beaches with very few people. Own and operate the dive catamaran Illusions. The rates per person for a double room sharing (2004) is USD 1,635 (excl GST) and for a twin room sharing USD 1,595 (excl GST). Offer 2 - 3 dives per day, depending on the time spent on land excursions. The program is flexible and can be adapted to suit each group's preferences. A week's cruise usually includes around 20 dives. "Fast drift dive though the pass with schools of grey sharks, bottlenose dolphins, rays, and even the great hammerhead shark! Out-of-this-world vis. " "I'm diving instructor, I've been in many dive location around the world, and believe me, the Tuamotu is unbelievable and there is not only Rangiroa and Fakarava, at least 10 other atolls have great dive spots with pristine warm waters. Open water is enough to come here, you're allowed to go 29m with this cetification. Let's go diving French Polynesia ! ;-)"
"It helps to understand French - at least enough to understand diving terms and instructions. Not as many fish as in the Red Sea, but lots of Black and White Tip Reef Sharks. However, avoid Tahiti. For serious diving go to Rangiroa - one of the world's largest atolls with loads of sharks." "Two passes full of pelagic fauna like 10 different kind of sharks, school of dolphins, manta rays, turtles, barracuda, sail fish, eagle rays... "
"Great visibility (60 m at least), different kinds of sharks (from hammer to reef sharks) and hundreds of them, eagle rays, turtles, moray eels, very nice current (approxm. 2-3 m/s!!) and dolphins on surface before jump - experience for all my life!" Tiputa Pass is famous for its large animals: grey reef sharks, turtles, manta rays, dolphins, barracuda and others. The pass is one of two entrances to an enormous interior lagoon, and you need to dive on an incoming tide. The season runs from February until November, but September is the best time for sharks. "Similar to Awatoru pass. We dived five days in these two sites and even during all those dives we could jump and jump in again - it's difficult to imagine something better. " "If you are interested in large pelagic animals, this is THE place. It can be done at various depth. Around 45-50 m there is ALWAYS a large number of big sharks of a variety of species. I dove 3 times there; I had dolphins playing at my side each time (mostly near the surface)." "Drift dives (strong current, 5-6 knots). Grey, blacktip, whitetip, silvertip and hammerhead sharks. Manta rays, eagle rays, napoleon fish, barracudas, jackfish and many others. Water visibility among 60 metres. Fantastic dives! " "The south pass is definitively easy to dive, and incredibly rich in diversity. Wall of grey sharks, amazing unspoiled corals with a huge density of reef fishes... "
"A truly amazing experience. Normally a drift dive through 18-30m with the Wall of Sharks with numbers of Reef Grey, Black Tip and the occasional Tiger and Silver "
"Not as demanding as the Tiputa pass of Rangiroa (and not as amazing), but a great dive. Lots of large schools of big fish; large pelagic animals (tuna, shark, mantas), many very friendly white tips at the ebottom. As in most places in Polynesia, the most amazing thing is how close animals get to you." "Put Palau dive sites to shame. In one dive I saw some hundreds grey reef sharks patrolling the pass (with the occasional white tip and silver tip). It's a jaw dropping dive spot even for someone like me who's not particularly keen on sharks. Corals are also in very good shape contrary to Tiputa in Rangiroa." "Magnificent drift dive and over benches of several dozens of grey sharks." "Grey sharks, leopards rays, tortoise and big napoleons." "Bikini Atoll is a great place to dive world war 2 ships wrecks and the shark pass. "Once you get to the Marshall Islands there's nothing to do BUT dive. Regardless, it is the best diving I have EVER experienced, even better than Palau. Reason being that you could go to 4 different atolls have 4 completely different yet equally as amazing dive experiences in each. Jaw dropping coral in Arno, eery WWII wreck dives in Bikini Wotje, massive eagle rays in Rongelap, sea turtles sharks in Ailinglaplap, etc. etc. etc. I lived there for a year, and so, got to experience more than the average vacationer. However, despite the cost time it takes to get there, the RMI is more than worth it. I, personally, was blown away." An American aircraft carrier which after the second World War became surplus to requirements. She became part of Operation Crossroads - a series of nuclear weapon tests conducted by the United States at Bikini Atoll in the summer of 1946. Its purpose was to investigate the effect of nuclear weapons on naval ships. Baker was detonated 90 feet (27 m) underwater. The Saratoga and 11 other crafts were sunk. The wreck of the Saratoga lies between 12 and 50 m. She is upright and in good condition with abundant sea life. A great dive - voted one of the best wreck dives in the world. Crossroads Baker nuclear weapons test, 26 July 1946. The Saratoga, to the left of the picture, is being lifted out of the water. She sank later that day. "US carrier, WWII. 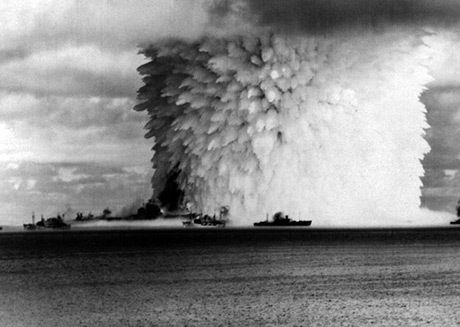 Sunk at Bikini atoll after war by Baker H-bomb test. Completely loaded when it was sunk. Bombs all over the place. About 160' to the sand. Best wreck anywhere. "Japanese battle ship sunk at bikini atoll. Largest superstructure I've ever seen, by a long shot. 170' to the sand. "This place must be the hard coral capital of the world! Enormous corals, anemonies, nudibranchs, WWII wrecks. There used to be lots of sharks, but the Chinese are illegally fishing them. I know because we caught and reported a boat shark fishing inside the atoll. Very hard to visit, no dive operation there. We went on an expedition trip. No tourist facilities. No restaurants. One grocery store which had nearly no merchandise. We brought our food with us. There's only one guest house on the whole atoll which sleeps 8 with 2 bathrooms. No hot water. Hotplate cooking in the kitchen. Very rustic. I'd go back there in a heartbeat. "Beautiful gorgonians at 24-30m. Unfortunately the area is overfished and lacks large fish, however, the corals are excellent, with many scorpionfish sp. and other macro life. The Cook Islands comprise 15 islands in the Pacific Ocean. Named after Captain Cook, who sighted them in 1770, the islands became a British protectorate in 1888. By 1900, administrative control was transferred to New Zealand; in 1965, residents chose self-government in free association with New Zealand. The dry season is from April to November and the more humid season, where typhoons are possible, from December to March. "We dived the Cook Islands last November, and we dived both on the main island of Rarotonga and the next largest island of Aitutaki (Pacific Divers on the former and Bubbles Below on the latter). Both islands were fantastic, but I would strongly recommend taking the short 'internal' flight to Aitutaki as it's far more spectacular and 'desert islandy' than the main island. It's also a lot quieter and the beaches are far better, but the BIG selling point is the huge lagoon in the centre of Aitutaki, and I would VERY strongly suggest doing the lagoon snorkel day trip with Mike (all the hotels etc know about Mike's lagoon tour). He takes you to some of the most fascinting spots in the lagoon, and you can see the most amazing marine life, including a giant clam farm! He then takes you to a deserted atol shows you how to open a coconut, and cooks the most amazing BBQ on the beach. An excellent day out, and certainly the highlight of our trip...But back to the diving: it is first rate. Good reefs, warm water, huge viz, some big life. We saw giant turtles, eagle rays, reef sharks, plenty of fish, etc etc etc... and there's something very cool about knowing you're the only divers in the ocean for 2000 miles (if you time your days right)." "The Cooks have good travel infrastructure, and good diving operators, but crown of thorns infestations have destroyed a lot of coral. " "I visited the Cook Islands in July 2007 and made a two tank dive with Bubbles Below on Aitutaki, and again with Pacific Divers (Muri beach) and The Dive Centre (Aroa beach) on Rarotonga. I encountered one white tip reef shark, several moray eel, napoleon wrasse, turtle, unicorn fish and eagle rays. Diving was fantastic in the blue ocean and all three the operators very professional. I preferred the first two mentioned before, as they had a person extra on the boat for safety measure." "We were diving with them in July 2010 during our stay in rarotonga. A great bunch of people, very professional and friendly. I did a dive package with them and I had a great time. One day i was the only diver on the boat with the guide Chris and boat captain Sasha and we saw a whale! I would dive with them again. " Pacific Resort Aitutaki: 5 star, 27 villas, suites and bungalows. Aitutaki Lagoon Resort and Spa Aitutaki: 4 star, only resort on a private island 2 minutes away on the ferry from the main island of Aitukaki. Pacific Resort Rarotonga: 2 star, 30 bungalows. Rarotonga and the Cook Islands, Lonely Planet, 2006. You can dive Truk Lagoon at any time of the year. Temperature varies little, being constantly between 24 and 31 oC whatever the month. The dryer months are January to March. See deals on Truk Lagoon liveaboards: best price guaranteed. "Picture perfect shipwreck - awash with coral and sea life. Each of the five holds offer exciting finds, however the highlight for me was the massive engine room which occupies the midships area, taking up 3 floors. "Deepish dive, fully intact upright shipwreck. Water visibility is good and many shark often frequent the ship. Excellent penetration opportunities for the trained diver. " "Another excellent wreck has a small Japanese battle tank on the deck. Penetration of this ship is a fantastic experience "
"Very Deep but a great dive for the untouched undamaged wreck that sits there. " "Tanks on the deck and other armaments, sunk during the US raid on the Japanese supply fleet after The destruction of Pearl Harbour, extremely photographic in warm water, sitting upright, a must see. " "I penetrated 6 of the Japanese feeded ships. All eeire and in surprisingly good condition. Lots of amo, and parts to feed a war. The penetration was the best Ive done (Even better then Thistlegorm). We went deep into the belly of some of the ships. What an experience. Huge Barricuda hanging aroiund on our exit. The ultimate wreck dive experience!!!! Do it!! " "What a great dive experience, what a great place to relax. I spent 5 days in Truck Lagoon Dive centre. Good people, good food, good centre but best of all - great diving. The diving at Palau is so good we have given it its own page. Please go to our new Palau Diving section. A small family owned and operated ecolodge offering diving. The tropical cyclone season normally runs from November to May. "Loads of fish, sharks, tuna, everything all at once - couldn't see the surface of the water there were so many fish. " "Cliff face dive with one of the largest bigeye travally schools ever seen. Baracudas, grey reef sharks and tuna. " "Depth of 35m to descend to the bottom of lava tubes. You then exit through a opening at approx 35m, circle the reef and slowly ascend. Spotted a Manta ray throughout the dive. Amazing. " "Got it all: walk in, drop down 10 mins through cave onto wall "
"55 minutes of penetration. Tons of life, Japanesse tanks." "This area has got the best all-round diving I've ever done. Walls, pelagics, lots of big stuff - sharks, mantas, schools of eagle rays, a great wreck, several plane wrecks and no crowds . " "Enter in what seems like open sea to hit a 1 km deep wall and cruise along in the company of giant leatherbacks, huge pelagics, black, white and grey tips, plus a few oceanic white tips and hammerheads. The best feeling I've ever had." "More fish species than I realised existed, let alone had ever seen." "Solomon Islands, deeper dive, destroyer sitting upright on the sand, largely intact as she sank very quickly in the battle for Guadacanal in WW11, penetration possible for the properly trained and experienced." "Tiny Island on the edge of the worlds largest lagoon. Clearest water, best visibility, friendliest staff. Highlight was diving with hammerheads." "Deep and those guns, wow "
"Silvertips that chase you away, make the turn and you will see 20 ft gorgan fans, sponge corals hanging down 120 ft. Light shinning through the trees make this dive site one of the best ever "
"Dive into huge crevaces and experience crayfish propelling themselves in all direction. Imagine a hundred crayfish going in every direction at high velocity. It is something to see." "Dive Munda is located in Munda, Solomon Islands,inside the Hotel Agnes Lodge. 190 au$ or 1520 SBD$ for 2 dives and all equipment rent. They didn't really let me choose what kind of dive to do. I went with 3 locals, nice BUT JUST. It was a 2 dives trip from 9am till 1 pm with an hour stop in a beautiful little island. I WOULDN'T DIVE WITH THEM AGAIN, MORE EXPENSIVE THAN OTHER PLACES AND NOT REALLY PROFESSIONAL... OLD GEARS TOO. " A commonwealth in political union with the United States, comprises 15 islands. "The best shore dive you'll ever make. Deep cut gorges, giant moai-shaped pillars, giant arches. An amazing dive, only feet from the shoreline. " Cambodia now has its own page on the site - for updated information please see the Cambodia Diving Section. Many of the dive sites around Cambodia are as yet completely undived. New ones are found virtually every week. There is a lot of hard and soft coral virtually untouched, the usual collection of reef fishes and an enormous variety of macro-life. The diving around the islands closer to shore (2 hours) reflects this and tends to be fairly shallow (10-15 m max). Further out there are deeper pinnacles, wrecks and a greater number of pelagics and larger fish. The cost for diving is around US$70 per day (2 dives) for a day trip, including equipment and food. A two-day liveaboard with 5 dives, costs around US$195. Diving Vietnam has moved to its own page. Please visit our Pacific section for the full low down on diving Vietnam. The Rough Guide to Vietnam, by Jan Dodd, Mark Lewis, Ron Emmons , 2006. The traditional diving season is from November to April. May is low season when the rainy season starts. As in many places though, the rains over the past few years have come later so May can be a good time to go. Prices and crowds are both lower then. Thirteen species of whales and dolphins visit Sri Lanka. Unique snorkelling expeditions take place on the west coast (Colombo region) from November through April. "I dived in Hikkaduwa with Poseidon Diving Station and would definitely recommend the area and the centre. There are some great wrecks, ranging from 1750-1900's, a mixture of steam and sail boats. There is also a chance to see intact soft corals on some of the deeper dives. Sri Lanka is a beautiful and friendly country with some great places to visit and tasty food. " "9 April � World War II: Japanese Navy launches air raid on Trincomalee in Ceylon (Sri Lanka); Royal Navy Aircraft Carrier HMS Hermes is sunk off the country's East Coast. She was the world's first ship to be designed and built as an aircraft carrier.Commissioned in 1924, Hermes served briefly with the Atlantic Fleet before spending the bulk of her career assigned to the Mediterranean Fleet and the China Station.Most of the survivors were rescued by a nearby hospital ship although 307 men from Hermes were lost in the sinking. The ship lies in 53 m of water in clear warm water on its port side and is intact. Teeming fish life. " Taprobane Divers offer fun diving for certified divers and a range of PADI courses from complete beginner to advanced technical diving. Their equipment, imported from the United Kingdom, comprises Scubapro, Aqualung and Cressi as well as Hollis and OMS for technical diving. "It's an Island which is a great diving spot for divers who would like to see different species of corals and well as marina line such as Green Turtle, Olive Ridley Turtle, Barracuda and many more. Each dive spot around the Island is different and the landscape is beautiful. Some of the life that had been found is White sharks, Barracuda, Swordfish, Sailfish, Great Hammerhead Shark, Black Marlin, Green Turtle, Olive Ridley Turtle, Dolphins as well as Blind River Dolphins and many many more. It's a great place to dive, but if one wants to dive the window of opportunity is from end of September till the end of March. In the off season the dive site can not be accessed as the sea get very rough and the viz becomes nill. " For more on diving India please see our new India Diving Section. For Sipadan, Tioman, Labuan, etc see our Malaysia section. 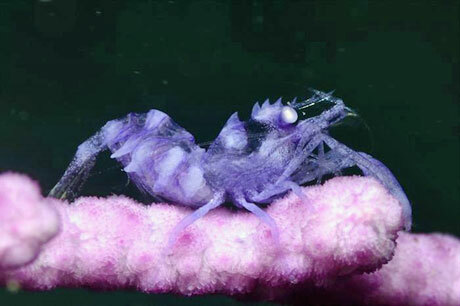 "Green Island rivals any dive site in the Asia area. A bit of a secret." "Schooling Scalloped hammerhead sharks during winter and 30m vis + a couple of great wrecks"
Andy Gray, Owner, Taiwan Dive. "Orchid Island down from Green Island is just like Green Island." "40 m vis all year round with abundant marine life, outstanding corals and a great wreck dive." "Kenting in the south has over 40 shore and boat dives"
"Beautiful site filled with an abundance of soft corals in very good shape." "Has excellent diving including an U/W volcano [near Hualien], one of only 2 sites in the world." English speaking guides and instructors. Regular PADI dive courses and fun diving trips into Southern Taiwan. Equipment sales and information. Run by English diver Andy Gray. Green Island, off the south east coast of Taiwan. "Some really remote island outside of Japan. Almost no non-japanese people do go there and that was good for me. Really unspoiled so far and so beautiful! " We endeavour to keep this site as informative and current as possible. If you would like to recommend, or warn about, a particular dive or diving location we'd love to hear from you. Monty Halls' book describes 60 of the world's best diving areas, and highlights specific dives not to be missed whilst you are there. It also aims to provide independent travellers with the other information they will need, such as about water temperatures, visa requirements, the best time of year to go and addresses of dive centres and recompression chambers. For more details read our review... or visit amazon.co.uk or amazon.com.